I love this story so much, especially in today’s climate of negativity and vitriolic mudslinging. Hopefully it will remind people not only of what the human collective can do when its heart and mind is solely focused on generosity, but it’s an example of pure and simple hard work. A rarity these days in times of short cuts and a declining work ethic. 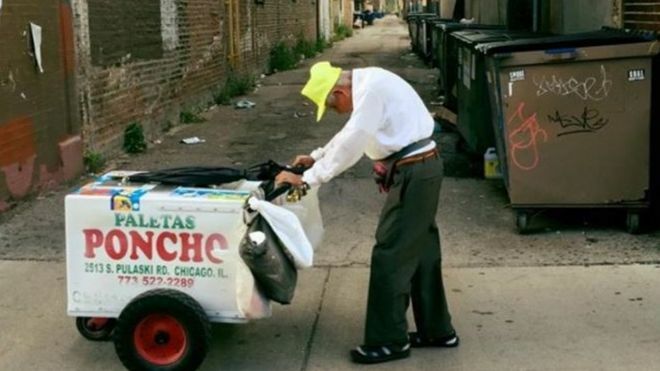 A Chicago paleta vendor (ice cream) named Fidencio Sanchez has truly shown the world that hard work is one of the most admirable traits there is. Recently retired, Fidencio had been an ice cream vendor, with his wife (who had to quit due to ill health) on the streets of Little Village for 23 years. For the neighborhood, he was a welcomed sight that harkened back to simpler times. Over the summer, he was rocked by the death of his daughter and was forced out of retirement to care for her children. Realising that he had to put food on the table, he went back to pushing his cart, working over 10 hour days to support his wife and grandchildren. A passerby was so moved by Fidencio’s work ethic and dedication, he set up a Go Fund Me page a week ago in hopes of raising some money for Fidencio’s plight. To his surprise, in a few days, the page had far surpassed his target of $3000 and to date has raised $201,000. Despite his good fortune, Fidencio says he has no plans to stop working – at 89!! Read that sentence again, just in case you were feeling lazy today and didn’t want to go to work. The man can barely walk, and yet, he takes to the streets to meet his responsibilities (responsibilities by the way he certainly wasn’t planning for). I swear to you, examples like these are what we should all be focusing on, especially those that think the world owes them. In today’s times, if it doesn’t happen quick and easy, the complaints start flying fast and furious, not to mention so many people out there who think it is someone else’s job to take care of them. Of course, we could place blame on a hundred different things (obsession with wealth, fame, social media, people tired of working so hard for so very little, and so on….) but when it comes down to it, there are times when good old fashioned hard work appears to be a dying virtue. Then again, I suppose now with platforms such as Go Fund Me, at least people can put their hearts in the right place. And there is nothing that makes me happier than when the human collective actually mobilizes for good and not just to tear each other apart. Now, I don’t know about you, but as it’s blazing heat in these parts (and we Englanders know it won’t last!) I’m going to get an ice cream.